Social media is a crowded (and noisy) place. Consider this: approximately 92 percent of B2B marketers in North America are on social media, as are 68 percent of small- and medium-sized enterprises. What’s more, nearly 59 percent of American consumers interact with brands on social media and at least 40 percent of women name social media as their preferred online channel. You’re convinced. The problem is, so are your competitors. How do you cut through the clutter? How do you make your social media accounts (and posts) stand out from the crowd? One way: Stellar social media copywriting – powerful words (and timeless copywriting formulas) to strengthen your social media posts and get better results. You already know that powerful words are crucial for boosting open rates, evoking emotions, and inciting readers to take action in your email marketing campaigns. Let’s talk about how you can leverage proven copywriting tactics to make a bigger impact on social media. Clear: Make your posts clear, not just to you and your coworkers but also (and primarily) for your audience. If there’s any ambiguity – any at all – then edit it into oblivion. Concise: There’s no better way to say it than the Bly way: “’Concise’ means telling the complete story in the fewest possible words.” While in most copy, “concise” and “brief” are not synonyms, they usually are in social: Some social media platforms have brief character limits so, within those limits, keep your words concise. Tell the shortest complete story possible. Compelling: Every tweet, every Facebook post, every everything should begin with “What’s in it for me?” And that me isn’t you; it’s your readers. Your social media audience. Because they’re only interested how you help solve their problems, allay their fears, and improve their lives. In other words, focus on benefits not features. Credible: Social media users are disinclined to trust you. Publish the truth, publish it often, and publish it freely. Urgent: Time-sensitive information always spurs action, whether it’s a limited-time offer or something your readers shouldn’t wait an extra second to implement. Unique: If your Unique Selling Proposition (USP) is the same as all your competitors’, then it’s not unique. Useful: Your social media text shouldn’t serve you; it should serve your readers. Ultra-specific: Especially with copy as concise and as frequent as social media posts, each should have a very specific focus – a very specific focus that directly relates (and complements) the usefulness of a given post. Problem: If you know your audience, it shouldn’t be too hard to identify a specific problem your audience faces. Agitate: The next step is to agitate the problem – to stir the pot until it hurts. Solution: It hurts and now, your readers are searching for a solution. Deliver one. Attention: Capture the reader’s attention, usually via a very relevant and timely hook. Interest: If you know your reader, then it shouldn’t be too tough to capture their immediate interest with every post. Desire: Interest is not desire; it’s the step beyond desire. It’s the point at which your audience feels compelled to act on their interest. Action: You’ve stoked the desire and now, you just need to give your social media audience the ability to take action. In other words, always end your social post with a powerful and straightforward call-to-action. 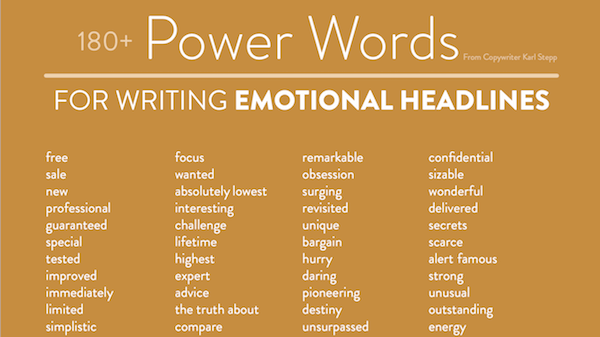 Power words are words copywriters use to spur a desired emotion or action. Different power words have different purposes, but, generally speaking, a power word: strikes a balance – it’s neither overly simple nor pretentious; sparks and stokes emotion, as emotion triggers even the most logical purchases; communicates clearly; and triggers curiosity. There are many more power words out there, depending on what type of social media posts you’re publishing. For example, ‘join’ is a powerful call to community; ‘consequently’ implies a strong cause-and-effect; ‘members only’ dictates exclusivity; and ‘no obligation’ reduces the barrier to entry. For more power words, check out the full tear sheet from CoSchedule. Want to know more about great copywriting? 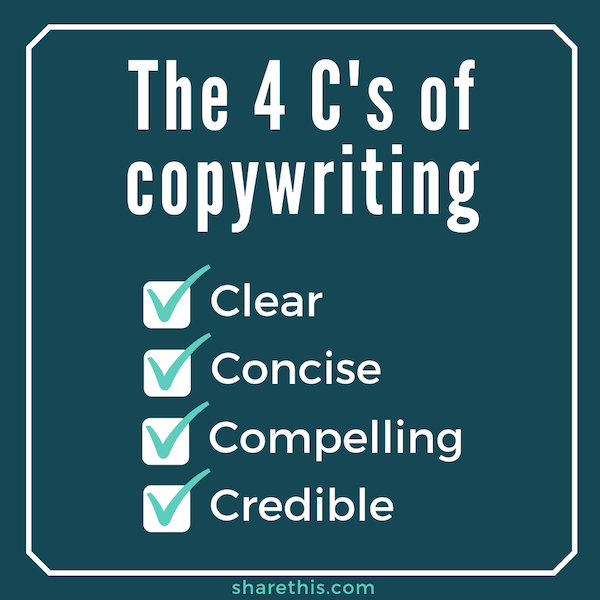 Copywriting does more than just improve your social media posts. Whether you’re looking to build your blog readership or drive shares on social media, great copywriting can easily turn a one-time visitor into a loyal customer. Learn how to rock your copywriting with the world’s best copywriting courses. And don’t forget to add follow buttons to your site to get as many eyes as possible on your fabulously written social media posts!